Ten IU Bloomington students define what it means to be a Hoosier. How things have changed since the first students enrolled in Indiana University nearly 200 years ago. 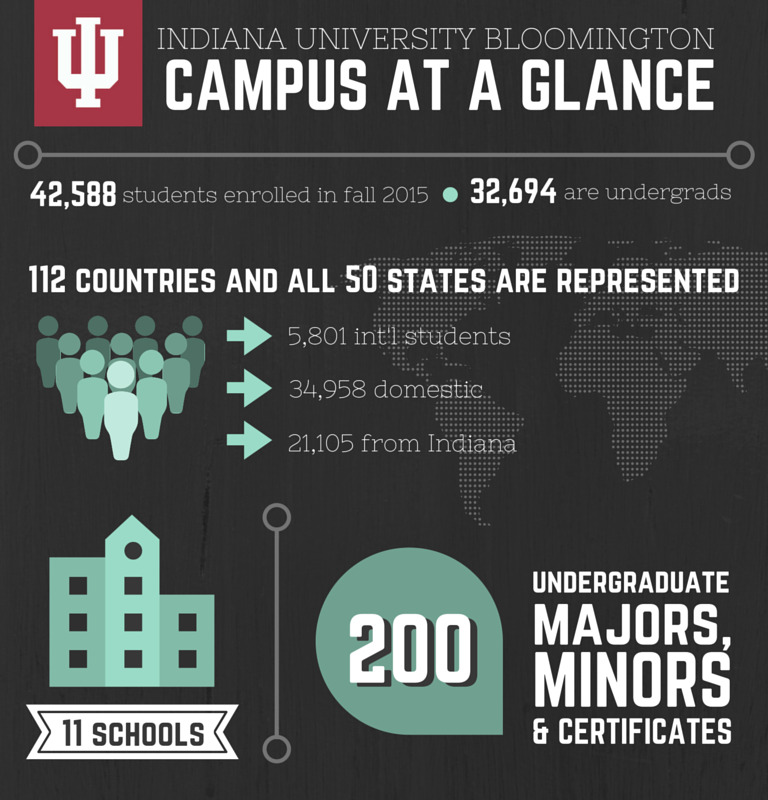 Today’s students come from 112 countries, 50 states in the U.S. and all 92 counties in Indiana. More than that, many bring insatiable curiosity, an eagerness to see as much of the world as they can -- in fact, one in four will study abroad before they graduate -- and a strong desire to make it a better place. No matter where they hail from, be it Indiana or halfway across the world, IU students bring with them interesting worldviews, cultural experiences and personal interests that dramatically enhance the academic environment of our campus. • A daughter of Syrian immigrants who organized a march to welcome refugees to the U.S. 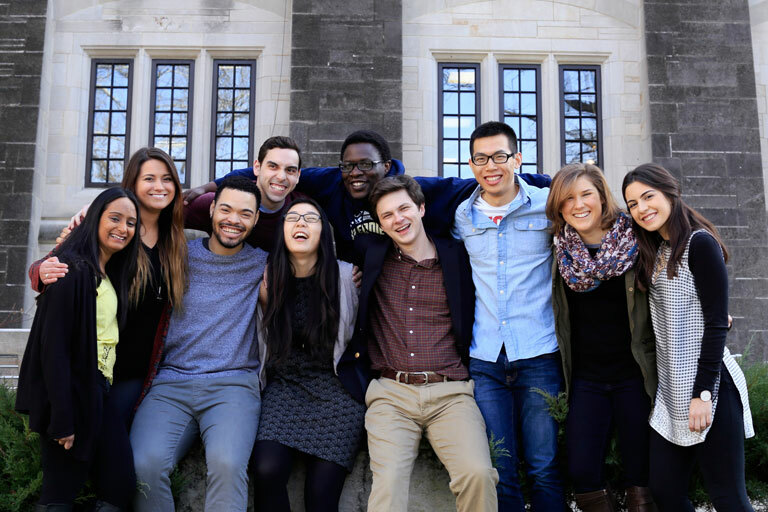 Whether working their way through college, adjusting to life in a new culture, fighting for social justice or simply trying to find their place in the world, these young women and men have embarked on individual journeys of self-discovery that collectively define what it means to be an IU Bloomington student. When Eric Gu first arrived on the IU Bloomington campus, he went straight to the iconic Sample Gates and had his picture taken. He keeps that photo on his phone, a symbol that Indiana University is his home. But the path the IU freshman took to Bloomington was anything but a stereotypical Hoosier tale. Growing up in Shanghai, one of the world’s largest cities, Gu knew he wanted to travel to America, the sooner the better. 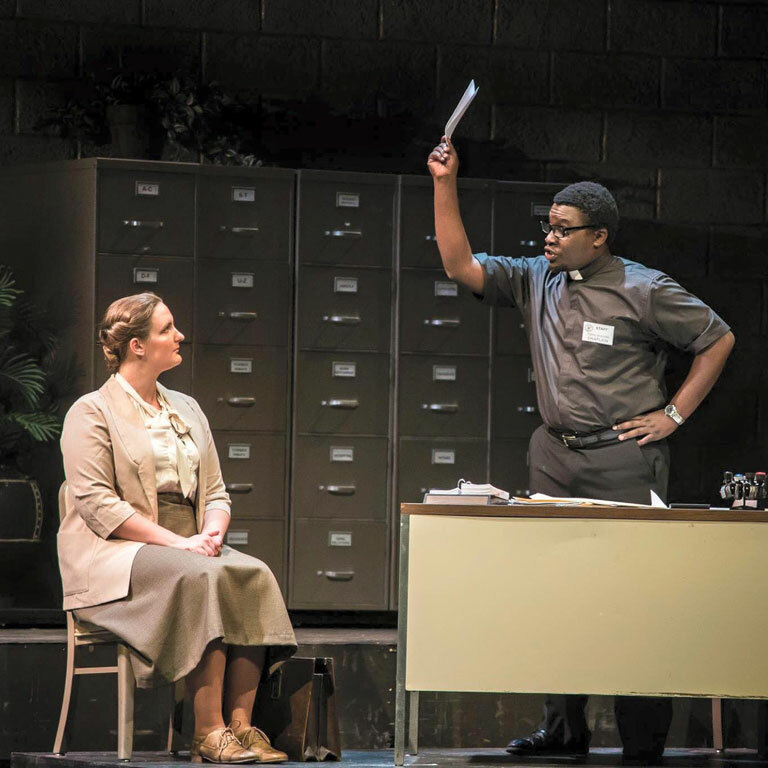 His chance came when his English teacher helped arrange for him to take part in a high school exchange program. It placed him in Owosso, a town of 15,000 people in central Michigan. But Gu adjusted to small-town life and thrived in the U.S. system of education, with its opportunities for studying a variety of subjects and participating in athletics and other extracurricular activities. He developed not only fluency and confidence in English but a knack for getting to know new people and for engaging in a wide variety of activities, something that would serve him well at a big university. When it came time to choose a college, he decided to try somewhere new. Making friends at IU didn’t just happen for Gu, who is studying policy analysis at the School of Public and Environmental Affairs. He got involved with student government at Briscoe Quadrangle, where he lives, and became the organization’s diversity chair. He is an international student ambassador with the Office of International Services, he works with a project that provides books to schools in Rwanda, and he is part of the IU Student Association’s REAL campaign, which develops campus policies to provide more resources for international students. He has a strong interest in environmental issues, energy conservation and transportation. Via his participation in IU’s Civic Leaders Living-Learning Center, he applied for and was selected as part of the first class of 20/20 Sustainability Scholars through IU’s Office of Sustainability. In that capacity, he is conducting research on campus vehicle-bicycle-pedestrian issues, especially on East 10th Street. And he keeps looking for new experiences to try. John McHugh traces his interest in China to his early childhood, when his father would take him to The Field Museum in Chicago. A fascination with ancient civilizations found a focus with the 2008 Beijing Olympics. “I became really interested in how China was portrayed as an ancient civilization but with modern significance and tremendous global importance,” he said. He opted to study Chinese language at the small private school he attended in the Chicago suburb of Winnetka, Ill. And as a high school student, he was selected to travel to China on a State Department-sponsored trip, an experience he described as life-changing. As an IU sophomore majoring in East Asian Language and Cultures at the College of Arts and Sciences -- and with two additional China trips under his belt -- McHugh has organized a campus chapter of Project Pengyou, dedicated to developing people-to-people relationships and increasing the number of Americans studying in China. It has organized panel discussions, musical performances and other events. The child of teachers, McHugh expected to attend a private college in the East. 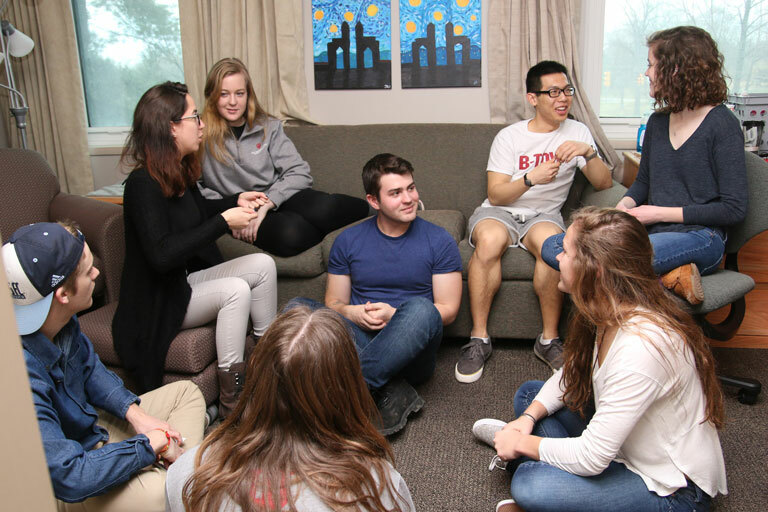 But an offer of a Wells Scholarship and berths in the Hutton Honors College and the Civic Leaders Living-Learning Center meant IU would provide individualized learning and the advantages of a large, diverse university. In this video, Eric Gu, Eric West Jr., Dana Khabbaz, Eddie Baraka Mony and Elena Navarro share their feelings about IU and the opportunities they have been afforded here. Along with continuing his language studies through IU’s Chinese Flagship Program, he has taken classes that include Environmental Ethics in 19th-Century American Literature, the Politics of Identity in China and Inner Asia, and the History of the Blues. 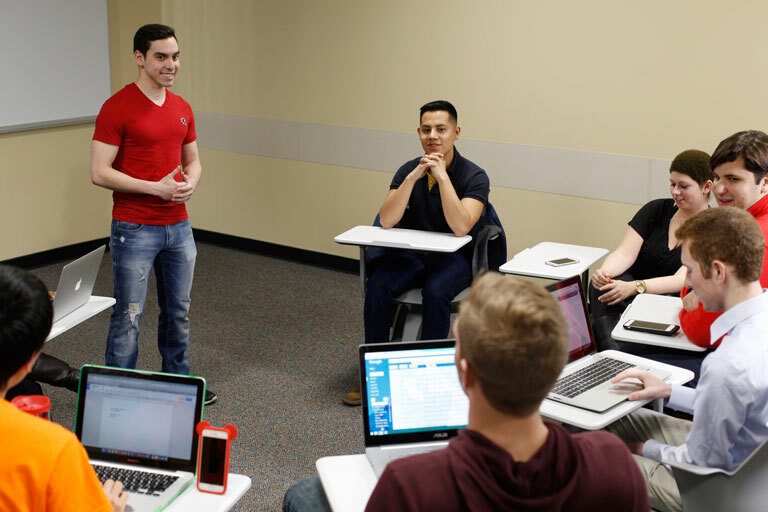 He especially values the rigor and classroom give-and-take of area studies courses, in which relative newcomers like himself share seats with graduate students and upper-level undergraduates. “You learn that being criticized or pushed is not something to be afraid of but something to welcome, because through that, you learn important things and remember them well,” he said. And he has discovered that learning takes place inside and outside the classroom, and that his IU experiences can create a powerful synergy. Last fall, sitting at the IU Auditorium and listening to Yo-Yo Ma and his group perform Zhao Jiping’s meditative composition “Moon Over Guan Mountains,” McHugh recalled seeing the exact view of the moon that inspired the music when he was on one of his trips to China. The performance took him back to a night when, sleeping fitfully in a yurt at an elevation of 15,000 feet, he awoke and walked outside to see stars that looked like “dancing purple fires” filling the sky. Growing up in Kenya, Eddie Baraka Mony loved listening to his grandmother sing traditional folk songs. He loved whistling as a child and always had an affinity for music. But it wasn’t until Mony attended high school that his affinity would develop into something that would take him thousands of miles from home and land him a spot in one of the most renowned music schools in the U.S.: IU's Jacobs School of Music. Mony’s journey began in rural Rongo, Kenya. His father died when he was young, and his mother did her best to provide an adequate home and education for her five children. It was at the Starehe Boys’ Centre and School in Nairobi where Mony first met volunteer teacher Christopher Walters, a classical clarinetist and pianist. Mony took up the clarinet and performed for the first time in the school’s production of “Oliver.” He also took part in a cultural exchange program to Finland where he heard a full orchestra for the first time. Hearing that music inspired Mony to look at a future in music. After high school, he studied music education and music arts at Kenyatta University. Then one holiday break, Mony found out a professor from the U.S. would be visiting the school. The professor was Kim Carballo, coordinating opera coach at the Jacobs School of Music and team member of Tunaweza Kimuziki -- Through Music All Is Possible -- which promotes musical exchange in Kenya and the U.S. It took Mony days to work up the nerve to sing for Carballo. But two days before she left, he performed “Ombra Mai Fu,” an aria by George Frideric Handel, which he had memorized by watching YouTube videos. Carballo encouraged Mony to try out for Jacobs, working with him over Skype to perfect his audition. Mony sent a taped audition -- he couldn’t afford the trip to audition in person -- and the rest is history. Now a sophomore, Mony is getting used to aspects of American life that can be awkward, at first, for an international student. He’s getting used to cars traveling on the right side of the road, thinking about money in dollar bills and not shillings, working on his English diction so people understand him better -- he has troubles with his r’s -- and adapting to American food. He gets to school around 6 a.m. to practice before classes start at 8 a.m. After classes in the evening, Mony spends another two hours practicing. He also holds a job at the IU Maurer School of Law, provides free voice lessons via Skype with students at Kenyatta University and travels to Kenya over breaks to volunteer with high school choirs and singers. He has also traveled to Eldoret, Kenya, to perform with Jacobs professor Sylvia McNair as part of IU’s partnership with AMPATH -- Academic Model Providing Access to Healthcare. Mony said the opportunities he has received, and the people who have helped him along the way, motivate him to give back. Evelyn Bai also knows what a little hard work and a helping hand can do, especially when you’re in a foreign land. Bai, like many of her peers growing up in a traditional Chinese family in Shenyang, was expected to do well in school and attend a good Chinese college. But a desire to be different and explore the world led Bai on a path to the United States, and eventually IU, where she learned there is more to the college experience than academics and resumes. 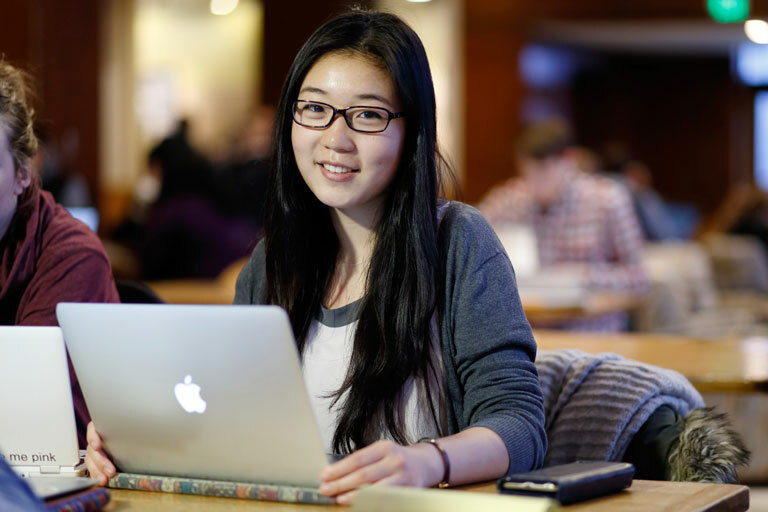 Here, she found herself serving as a connector between domestic and international students. Bai, a junior studying psychology and economics in the College of Arts and Sciences, first began thinking about traveling abroad in elementary school. At 17, she entered her senior year at a high school in Glen Ellyn, Ill., as part of a cultural exchange program. Although a little nervous, Bai was comforted by her fluency in the English language -- she had been learning it since the second grade -- all the American movies and television shows she had consumed as a teenager and her deep desire to see the world. She was also driven. Having never been a part of organized sports -- academics take precedence over athletics in China -- Bai joined the track team. After high school, Bai spent a year at Rice University before transferring to IU. Her Type-A personality immediately set in -- she took 19 credit hours, maintained a 4.0 GPA, held down two jobs and joined as many clubs and organizations as she could to “pad” her resume. After a lack of genuine involvement kept her from receiving a leadership position in a student organization, Bai decided to re-evaluate her goals. Bai threw herself into the International Student Ambassador program, becoming one of its most involved students. 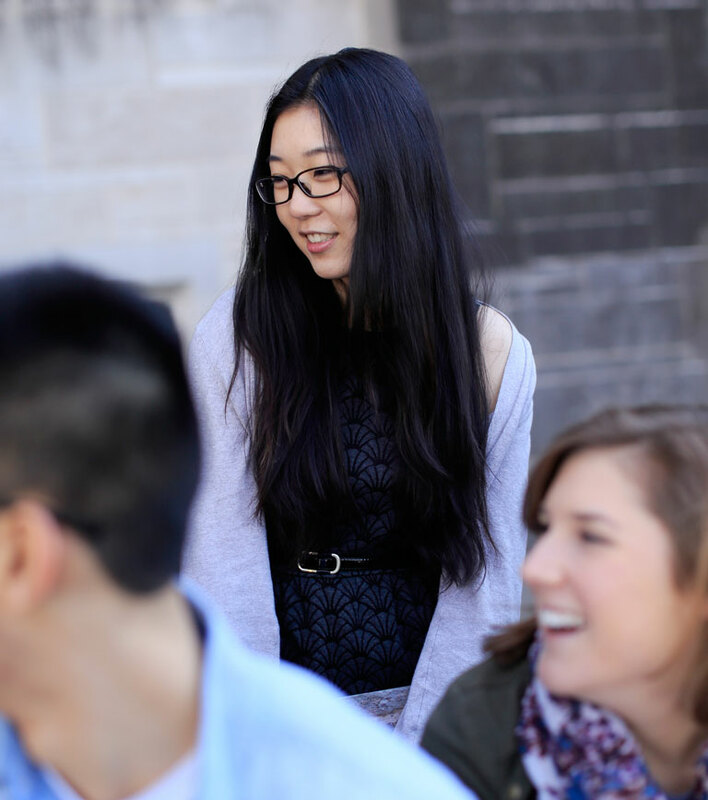 Bridging the gap between international and domestic students became her calling. In 2014, Bai traveled back to her high school in China as part of IU’s Hometown Hoosiers program. With heartfelt honesty, she answered all of the students’ questions about being a Hoosier and shared her own story of struggling to find balance and purpose in her life. That year, the high school -- which previously had zero applications to IU -- had 20 students apply. Bai has also made a point of joining organizations and clubs that are typically made up of domestic students. She is pursuing a certificate in the Liberal Arts and Management Program, is part of the IU College Luminaries Program and is involved in 180 Degrees Consulting, a student-run consultancy that gives back to the local community through pro bono consulting. Language barriers and cultural norms can make it trying for international and domestic students to connect, she said. For instance, Bai said she is really funny “in Chinese” but sometimes too intimidated to make a joke in English for fear she’ll be misunderstood. She also struggles to differentiate between American sarcasm and reality. But it is important, she said, for international and domestic students to break those barriers and not be afraid of those sometimes awkward moments. 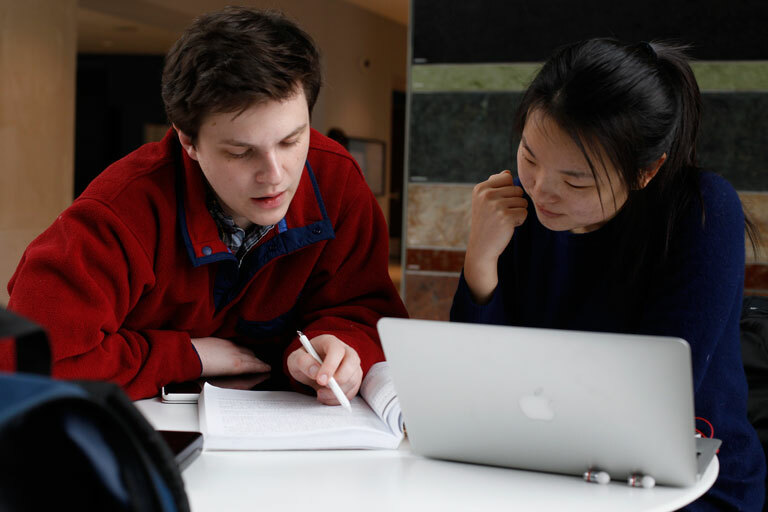 “It takes both international students stepping up and putting effort into learning the language and culture, and it takes domestic students to be understanding and willing to help,” she said. As she looks ahead to graduation, Bai isn’t sure where she will end up. And for the first time, she isn’t stressing about being the perfect student and finding the perfect job. While Bai is building bridges between students, some others are working to make the campus a more welcoming place for those who will follow them to IU. With his warm smile and easy-going manner, Miguel Yáñez doesn’t have trouble making friends. But the IU senior has taken a deliberate and energetic path to social involvement in his time at IU Bloomington. Not content with finding his own place at IU, he has worked to make the university and its Kelley School of Business more welcoming for newcomers and more engaged with the wider world. He became active in the IU chapter of Nourish International, an organization that harnesses the energy and idealism of college students to support sustainable development projects in developing countries. The IU group has raised money for nutrition and education programs in Guatemala and Peru. “It’s really nice to see that all our hard work throughout the year pays off,” Yáñez said, noting that IU students travel overseas to assist with implementing the projects. He also joined the Association of Latino Professionals for America and the IU chapter of Kappa Eta Phi, a multicultural business fraternity whose members are men and women from countries around the world. Finally, he revived a dormant chapter of Out at Kelley, a campus organization dedicated to developing lesbian, gay, bisexual and transgender leaders and their allies who promote awareness, acceptance and openness in business. Yáñez grew up in Chihuahua, a city of nearly a million people in northern Mexico that was plagued with drug violence. Concerned about safety, his parents sent him to Montreal on a student exchange program for his final year of high school. The family relocated to the Houston area the following year. Yáñez attended San Jacinto College, a local community college, before transferring to IU, drawn by the beauty of the campus, the reputation of the Kelley School and the chance to develop his independence and prepare for a career. A finance and accounting major, he scoffs at the notion that accounting is a “boring but necessary” subject that students will study only because it leads to a good, secure job. IU Bloomington is a big place, and so is the Kelley School; and such size can make students feel anonymous and overlooked. But Yáñez said faculty and staff have been much more than helpful. For Yáñez, career moves included an apprenticeship last summer with PricewaterhouseCoopers in San Jose, doing tax work for venture capital firms. After graduating this spring, he will start a job in Chicago with Ernst & Young, the giant accounting firm. Priya Vanka didn’t immediately feel at home at IU, where some of her first acquaintances seemed close-minded and uninterested in other cultures. 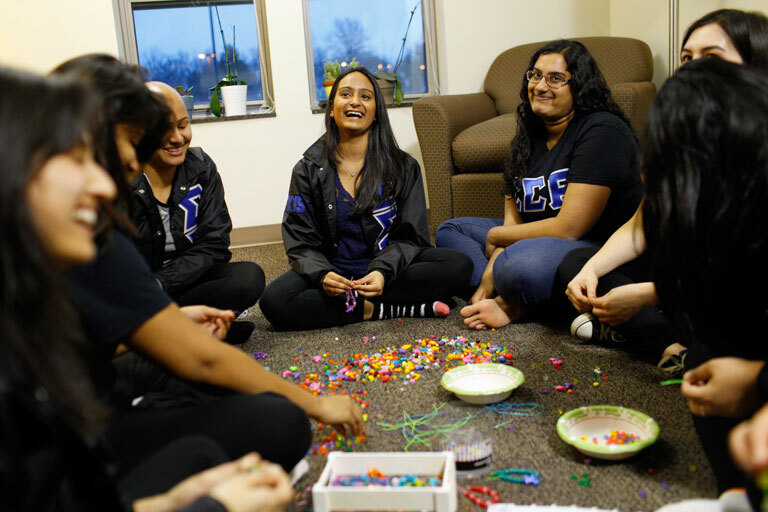 But rather than complain, she did something: She organized IU’s chapter of Sigma Sigma Rho, a sorority for women of South Asian ancestry. With nine members, the sorority is an intimate sisterhood focused on social relationships and activities related to the group’s philanthropy: education about and prevention of domestic violence. “Our events are typically cooking Indian food and watching movies together, speaking our language together,” Vanka said. Vanka was born in India but moved to the U.S. when she was 4 and had a typical American childhood in suburban St. Louis. But when it came time for high school, her parents sent her to India. They wanted her to experience her own culture and get to know her extended family. She lived with an aunt and uncle, spent time being pampered by her grandparents and enjoyed attending international schools where teachers were stern but motherly and many students were like herself: children of Indian emigrants sent back home for high school. Back in the U.S. for college, she chose IU for the beauty of the campus and the reputation of the Kelley School of Business. She switched her major first to public affairs and then to informatics in the School of Informatics and Computing. “Learning programming and doing practical things, actually figuring it out -- that’s what I like about it,” she said. 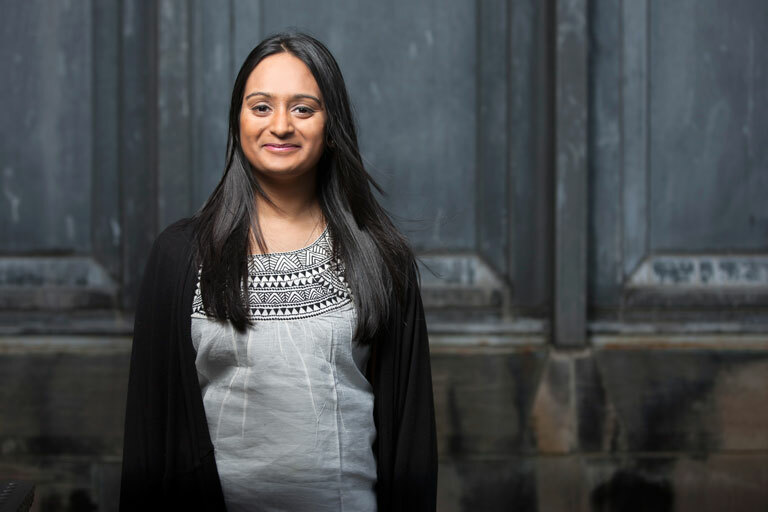 As the child of immigrants and part of a family that she describes as traditional, Vanka felt pressure to apply herself to her studies and not let herself be distracted from academic goals. Changing majors didn’t come easily. But friends and mentors at IU’s Student Life and Learning office, where she has worked part time at the help desk since her freshman year, encouraged her to find the best fit. “They taught me that it’s OK not to know. It’s OK to explore,” she said. She also credits her supervisors and co-workers at Student Life and Learning with helping her grow as a person and develop leadership skills and the confidence to start a sorority. With a marketable informatics degree in her future, Vanka expects to pursue work with a business or consulting firm. But her long-term goals include graduate school in higher-education student affairs and a career that includes advising young people the way others mentored her. Already, as an IU student, Vanka is playing the mentor role with her sorority little sister, Vaishali Shenwai. ﻿Students are also using activism and scholarship to transform not only the campus but the world beyond. 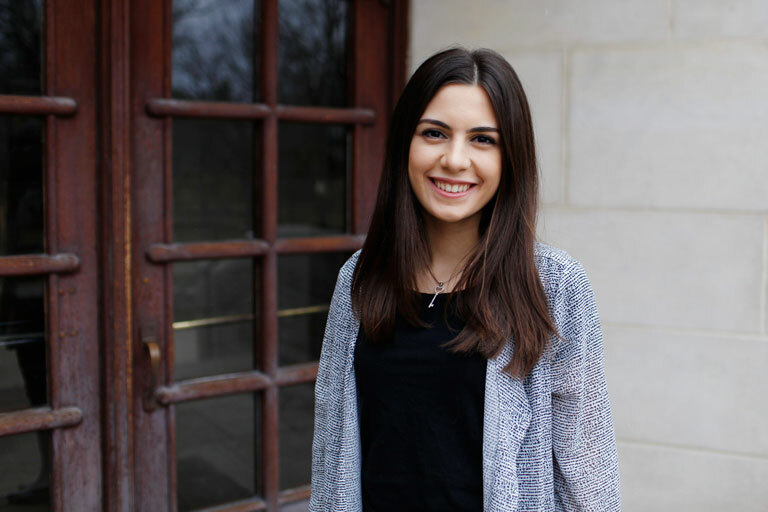 IU junior Dana Khabbaz felt a range of strong emotions last fall when states around the country, including Indiana, engaged in strong debate over the issue of accepting Syrian refugees. Khabbaz has been inclined to political activism and advocacy since she was in high school. And the plight of Syrian refugees was personal. Her parents are Syrian immigrants. She has grandparents, aunts, uncles and cousins who live in Syria. She couldn’t tune out the human misery that people were trying to escape. At IU she has organized a clothing drive, an academic panel and a benefit concert for Syrian refugees. She first thought there was nothing she could do in response to the governor’s order. But a friend prodded her to do more than complain and criticize -- like organize a march or a protest. “And I thought, 'You know, that’s not a bad idea,'” she said. As co-president of IU’s United Nations Association, which supports human rights at home and around the world, she reached out to other campus organizations and got the ball rolling. The resulting protest attracted over 100 people who marched from Sample Gates to the Courthouse Square. The UN Association is now organizing a #RefugeesWelcome campaign on social media. The experience prompted Khabbaz, who is double majoring in political science in the College of Arts and Sciences and international studies in the School of Global and International Studies, to work with leaders of other campus humanitarian organizations -- many of them small and focused on specific issues or parts of the world -- to organize the Human Rights Coalition to respond quickly and efficiently when issues arise in the future. She also is a founding member of a new student diversity campaign called For All. “Essentially the goal of the campaign and the coalition is to celebrate and encourage diversity and to make connections between different students and student organizations on campus,” she said. Khabbaz has been making connections at IU -- in the classroom, on campus and in the community. This year she has devoted her efforts to the UN Association. She has also worked with the Muslim Student Association, Oxfam IU and other groups. Last year she organized a film showing and panel discussion on the food crisis in South Sudan and a discussion of cultural perspectives on rights and conflict in Israel and Palestine. Khabbaz was born in Chicago and moved at age 5 to Northwest Indiana. The oldest of three sisters, she graduated from Valparaiso High School. Until civil unrest began in Syria in 2011, the family traveled each summer to Damascus to spend time with relatives. Those travels, along with her awareness that the family was singled out for scrutiny at airport checkpoints, helped develop a sense of cultural identity and the importance of social justice. Khabbaz settled on IU when she was offered a Wells Scholarship, which provides not only funding for tuition and opportunities to take small seminars but support for overseas study, an important benefit for the double major. She studied in Spain last summer and hopes to travel to Jordan to interview Syrian refugee women for a senior research project. In the classroom, Khabbaz is drawn to small, rigorous courses with readings and discussions that challenge her point of view. A particular favorite was taught by IU professor Feisal Istrabadi, former Iraqi ambassador to the U.N., on post-conflict reconstruction of nations. Like Khabbaz, Samantha Strong wants to use her knowledge and education to change the world by helping others. Born and raised in Indianapolis, Strong grew up a Hoosier -- both of her parents and brother attended IU. But in high school, Strong was adamant that she wanted to take a different path. Then she visited IU as a Wells Scholar finalist and saw just exactly why her family had chosen the university. Originally Strong had a double major in journalism and neuroscience as a way to satisfy her desire to write while also pursuing a path to becoming a doctor. 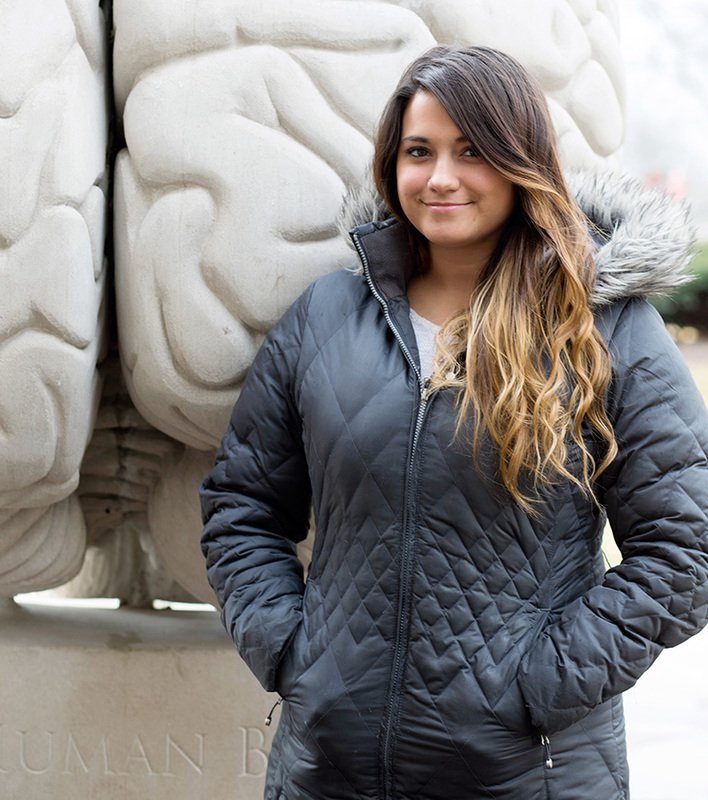 But during an ethics class her freshman year, she fell in love with bioethics and decided to switch gears, dropping her journalism major and switching from neuroscience to bioethics through IU’s Individualized Major Program. During her freshman year, Strong was introduced to the Poynter Center for the Study of Ethics and American Institutions. She spent a semester working on a research project with David Smith, a Nelson Poynter Senior Scholar at the time, and eventually began attending the numerous discussions and lectures at the center. She also served as the sole undergraduate representative on a monthly panel featuring Media School scholars discussing ethics and communications. In 2015, she won the undergraduate research award from Poynter for her research focused on the philosophical and ethical implications of the availability and affordability, or lack thereof, of two hepatitis C drugs. 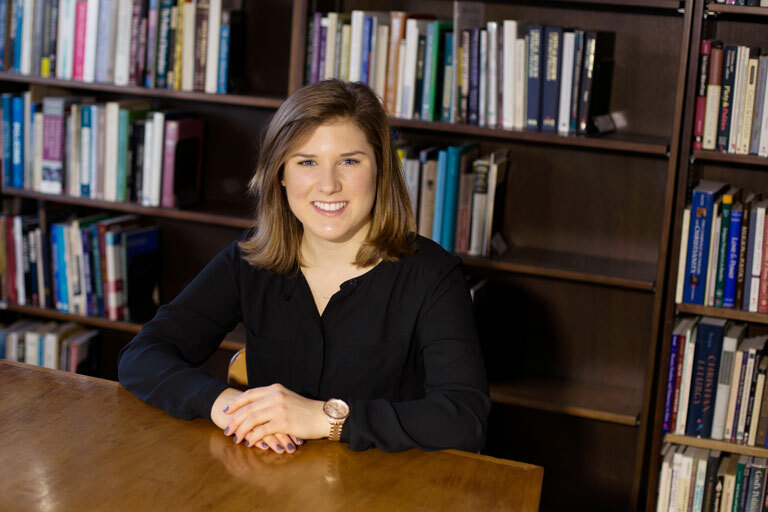 During her freshman year, Strong also connected with Sandra Shapshay, director of the Political and Civic Engagement (PACE) Leaderhip Council and faculty of the IU Center for Bioethics, who became her mentor and individualized major sponsor. Strong has built on her earlier research, now focusing on the impact drug affordability has on state Medicaid programs. “It is this big thing I didn’t know existed three years ago, and it is now my passion,” she said. Not only has Strong grown as an analytical thinker and writer, Shapshay said, but she has demonstrated a drive to make the most of the opportunities available. When she is not working on her research, Strong is involved in the College Luminaries Program, which connects alumni with students in the College of Arts and Sciences’ 80 departments, programs and schools. Strong previously served as co-director of the program and said it is important to her that students have the opportunity to network. She also serves on the Board of Aeons, a student advisory board; is a leadership council member on the Political and Civic Engagement Advisory Board; and served as visual design and publishing executive on the IU Journal of Undergraduate Research. 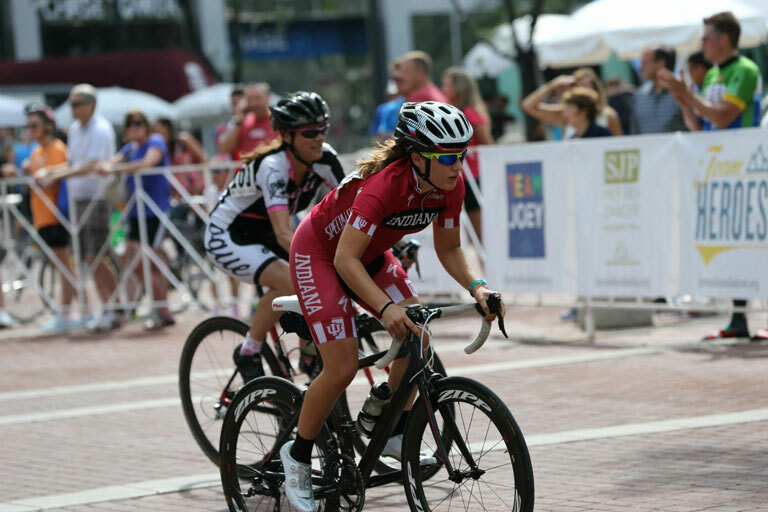 Although she no longer competes due to injuries, the self-described Type A overachiever is also a nationally ranked triathlete who currently cycles and jogs daily. She’s also graduating in May, a year early. After graduation, she plans to move to Washington, D.C., to gain some “real-world experience” before applying for grad school. Strong credits IU with providing her the “safety net” to try new things and define success on her terms. Eric West Jr. has definitely stepped out of his comfort zone during his time at IU. The oldest of three, West spent his childhood between Indianapolis and Las Vegas. Raised by a single mother, West was forced to grow up at an early age, serving as a both a big brother and father figure to his two younger siblings. When West was a sophomore in high school, his math teacher told him about his experiences at IU Bloomington. West went on a tour of the campus and fell in love. From that point on, it was IU or nothing. With the help of the 21st Century Scholars program, West made his way to IU. Although initially planning to be pre-med, he changed his major freshman year after hearing about human development and family studies in the School of Public Health. Coming from a multicultural background -- his father is black/Caucasian and his mother is Native American/black -- West said he has always been curious about how his background affected him both culturally and biologically. Although enthusiastic about school, West had a hard time adjusting his freshman year to the pressure of being a first-generation college student. In this video, Priya Vanka, John McHugh, Elena Navarro and Eddie Baraka Mony share what they think connects all students across IU. But West pulled himself together and buckled down. He not only began achieving academically, he became more involved on campus, particularly serving as a mentor in the Groups Scholars Program, which helped him with this own struggles. “I became a Groups mentor because I wanted to mentor kids who are going through the same thing I went through -- being overwhelmed and trying to be the voice of their family,” he said. Through IU’s Office of the Vice President for Diversity, Equity and Multicultural Affairs, he also lived out another childhood dream of traveling abroad. The young kid who had his picture taken in front of a Chinese background at a Las Vegas hotel, fantasizing about the world outside, has now traveled to South Korea, China and Japan as part of OVPDEMA’s study abroad program. He also spent time teaching English in Spain. He has since become a DEMA ambassador, helping to promote the office’s programs such as its study abroad program. Although being a first-generation college student can be tough, West -- who hopes to one day work for a software company developing new technology or as a college professor -- said he hopes his story helps others realize they are not alone. “I’m very proud,” he said. “I’ve come a long way, and I am gaining a lot of confidence. I love being at IU. All the things I’ve done in college. I’m just really happy to be here." Elena Navarro also knows what it is like to be a first-generation college student. Growing up in Schererville, Ind., Navarro had an early passion for learning and parents who nurtured their young daughter’s pursuit of knowledge. But when Navarro was 10, her father passed away unexpectedly. The journey of processing her feelings about losing one of the most important people in her life set Navarro on a path that would eventually lead her to IU. Although Navarro was always drawn to IU Bloomington, she considered attending a campus closer to home because she wasn’t sure she could afford to move away. But Navarro’s mom wanted her daughter to experience everything college had to offer, so she encouraged her to find a way to make IU Bloomington happen. When Navarro arrived on campus, she found a job at IU Campus Recreational Sports. While majoring in psychology and minoring in folklore and ethnomusicology, she spent 29 hours a week earning money to help keep her in school. Then her junior year, Navarro took a Foundations of Clinical Science course with assistant professor Cara Lewis and immediately found a topic, and a professor, that would elevate her academic course. Lewis was equally impressed with her student and asked Navarro to join her Training Research and Implementation in Psychology lab the following semester. Two months after Navarro joined the lab, Lewis encouraged her to apply for a National Institutes of Health Diversity Supplement, which eventually allowed Navarro to quit her job and focus solely on school. 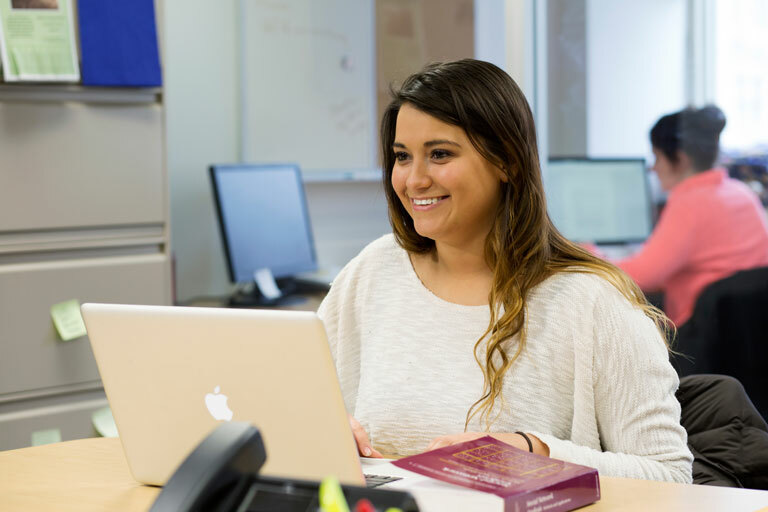 Navarro now has time to work on her honors thesis and has co-founded ADAPT Consulting, which pairs students with a business or nonprofit to apply industrial/organizational psychological research to enhance the workplace. That humility and her ability to work hard for what she wants are what make Navarro so special, Lewis said, and what she believes has led to her success. Navarro will continue to work in Lewis’ lab after graduating in May; her supplement is for two years. She then plans to attend grad school and become a clinician.